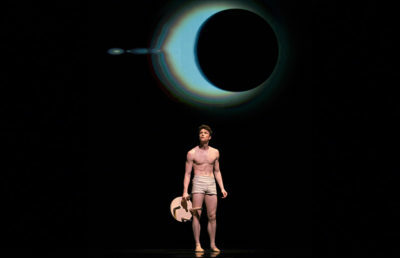 On Friday, San Francisco Ballet opened its doors for the sixth program of its 2019 season. “Space Between” has a total of three acts, each emphasizing distinct musical and aesthetic atmospheres. The great contrasts in lighting and color palettes create a program of dynamism and diversity. The production takes the audience from a lighthearted school gymnasium to a dark isle for the dead and the eccentric world of Björk’s legacy. “Rodeo: Four Dance Episodes” warmly opens the curtains to a pastel-colored gym. The dancers are also clad in light pink, blue and beige to match the soft and welcoming set interiors. The music — composed by Aaron Copland — is extremely upbeat and lively, exciting the childlike vivacity within each of the dancers. This segment clearly aims to establish a mood of familiarity and fondness. At times, some of the dancers perch on the edge of the stage together, as if they are taking a quick break from their exercise routine and chatting leisurely. Brotherhood and chemistry are demonstrated clearly in the dancers’ quirky interactions with each other. Occasionally, they seem to be engaging in harmless friendly rivalry, making the audience chuckle. In the act’s fourth episode, the characters create a dancing ring — with one person in the center showing off — as if they are at a party. The characters in this segment are grounded and down-to-earth, not afraid to have fun with the space and playfully compete with each other by using their dancing skills. The moment is certainly refreshing because it feels like a glimpse of real students simply freestyling rather than a practiced performance. The second act of the show, “Die Toteninsel,” cannot be more different from the first in regard to the atmosphere. This presentation was the world premiere, and choreographer Liam Scarlett certainly outdid himself. Utilizing the music of Sergei Rachmaninoff, simple golden light and neutral colors, “Die Toteninsel” truly accentuates the mysterious and dark nature of death. An enormous honeycomb-shaped light occupies the top right corner of the stage, illuminating the dancers’ outlines in an eerie, dim glow created by lighting and scenic designer David Finn. Several times, the dancers glide in sync with each other and the music toward this light, as if they are in a trance. This repeated movement — coupled with the shape of the light — perhaps is a reference to the collective mindset of social insects such as bees. The set closes, however, with an image of painful isolation; one dancer sinks to the floor as the lights fade to black as if he was burned by getting too close. The synthesis of contrasting themes such as hope and alienation into a singular smooth piece proves that so much effort goes into making a performance look effortless. The legacy of veteran artist Björk is certainly honored well by “Björk Ballet,” the final act of the program. This segment captures Björk’s esotericism and distinctive color exceptionally. During “All Is Full of Love,” the dancers resemble a flamboyance of flamingos moving slowly amid the silver, plant-like props of varying lengths. “Bachelorette” is equally flamboyant, with a more upbeat pace. The dancers twirl within fiery wisps of red silk and sash. Even more impressive is “Hyperballad,” in which a dancer moves flawlessly atop a platform carried by four people. Such coordination and balance are undoubtedly difficult to achieve. Yet, the dancers executed these techniques as if they were second nature to them. Occasionally, a dancer with flashy neon fringes appears to trot across the stage erratically. At first glance, this intervention may seem out of place and random. But little details such as this are truly able to capture the unpredictable and avant-garde spirit of Björk. From neo-Romantic classical music to contemporary legends, “Space Between” covers much more than the beauty of ballet. San Francisco Ballet has once again managed to attract spectators seeking an evening full of various art forms. Magnificent as it is, “Space Between” enraptures audiences with its unconventional lineup and magical execution.